Postoak Florist proudly serves the College Station / Brazos Valley area. We are an Aggie owned and operated flower shop, established 1986. Our store is committed to offering only the finest floral arrangements and gifts, backed by service that is friendly. Because all of our customers are important, our professional staff is dedicated to making your experience a pleasant one. That is why we always go the extra mile to make your floral gift perfect. 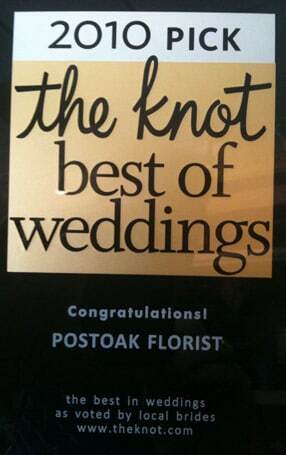 Let Postoak Florist be your first choice for flowers. If you have any questions or need more information, please contact us by e-mail at postoak@postoakflorist.com or call us directly at (979) 764-0091. U.S. orders must be received before 1:00 p.m. in the recipient's time zone to assure same-day delivery. Orders received after that time will be delivered the following day. Orders for gourmet food baskets must be placed at least 24 hours before intended date of delivery. When requesting a specific delivery time, we require a window of ninety minutes to ensure delivery. We will do our best to accommodate deliveries at specific times, but deliveries are usally made in the order they are recieved. To request a specific delivery time, please call the store to talk to an associate directly so that we can make sure your order has the proper attention it needs. Time deliveries are not accepted the week of February the 10th - 16th, nor are they accepted for the Thursday, Friday, and Saturday before Mother's Day. All recipients at residential addresses are called before attempting delivery. Typically, we do not attempt a delivery until we know that the recipient will be available. However, a delivery can be left with a neighbor or alternative contact at the customer's request. Deliveries are never left at a house outside due to the weather conditions in Texas, and always require a signature / time stamp, before they are relinquished to the recipient. Recipients at workplace environments which are regularly staffed are not typically called ahead of time. Business orders typically are delivered in the morning, and are always signed for and time stamped. If the customer wishes to remain anonymous, the card may be left blank, but if the recipient calls us, we are required by law to relinquish the name of the person who ordered the flowers. We are unable to make deliveries on Sundays. Deliveries requested on this day will be delivered the following business day. Exceptions are made for funeral orders in excess of $350.